As a Church school, our vision is that children learn to live life in all its fullness. This fullness involves developing academically, physically, socially, spiritually, morally, culturally and artistically. Our aim is to making learning a life long passion. 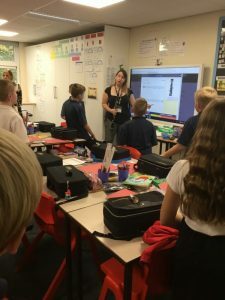 We want the children of our school to be respectful and honest with a sound knowledge of right and wrong and the role they have in our school, local and wider community, both now and in the future. 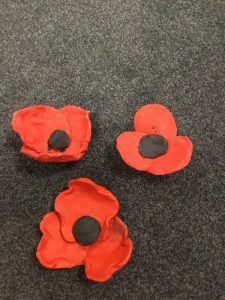 Through our broad curriculum, we aim to nurture tolerance of others, self reflection and independent learning skills, children who have the resilience to solve problems and persevere with new skills using a ‘have a go’ attitude towards their learning. The curriculum content is progressive and we are beginning to adapt it to reflect what is relevant now, special anniversaries, the local area and children’s interests whilst ensuring coverage of the statutory curriculum is thorough. We develop our curriculum to meet the needs of our children, there is an inbuilt flexibility that enables skills to be taught at an appropriate level for each class through topics that have relevance and meaning. We enjoy working together and sharing our learning. This can be through pairing classes for key events, such as World Book Day. Providing opportunities for children to work together - Year 6 enjoy working with Reception class. We also use our curriculum as a way of providing opportunities to share learning. World Faith Week and One World Week enable children to present their learning to others. Whole school poetry performance is used to develop performance skills and share our classic poems. 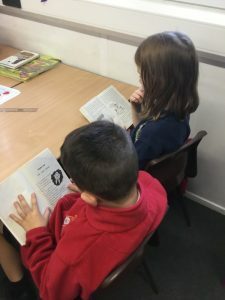 We believe in developing a love of learning and this is encouraged through are daily DEAR time (drop everything and read) and story time where children in all classes share stories. 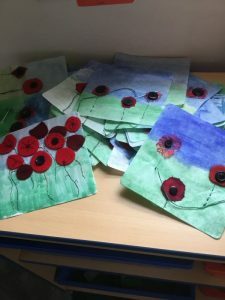 Our whole school focus on the Armistice led to some amazing art work and a poppy wave made of poppies sewn by each child in school. In additional the writing, History and Geography skills showed good progression through school. 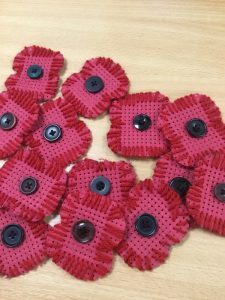 Every class engaged in PE linked to the Armistice. For further details about how we learn different subjects, including phonics and reading, please refer to our curriculum statement below or to the relevant pages on our website. We share our curriculum through our twitter feed where work is regularly shared. If you would like further information about our curriculum, please speak to Mrs Russell who can organise a paper copy for you or a meeting with Mrs Upham or your child's class teacher. Charlotte described school saying, "This small village school has excellent staff and well trained teachers to teach the children. Here children - who are learning to be respectful and kind-receive amazing education." Our curriculum adapts as needed in order to meet the needs of our children. Where possible we seek out visitors who will enhance and enrich our school curriculum. We work with Hand to Mouth throughout the year. 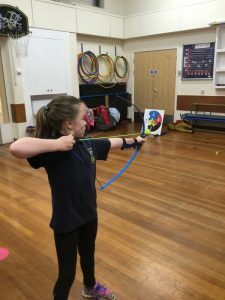 We are using sport funding to enable more competitive sport to take place encouraging children to participate in a variety of sports both individually and as part of a team. This is held as part of our enrichment afternoon when key skills are taught in small groups focusing on art and DT. These afternoons are not only about increased opportunities but about developing positive working relationships in groups and enhancing skills in design and evaluation. Following the success of our enrichment afternoons we have added enhancement sessions too where children will be able to participate in dance and performing arts and to provide additional specific feedback and assessment time for all our children. Both our enrichment and enhancement sessions are held on Wednesdays. As a result, our children have 3 PE sessions for 2 out of 3 weeks in addition to the daily mile. We have also added small group session of PE and team games to focus on developing resilience, teamwork, confidence, sports leadership and specific sports skills as part of our nurture and wellbeing provision. We are developing lessons to focus on promoting positive mental health and during Children's Mental health Week learnt about staying healthy inside and out. Classes had opportunities to focus on breathing and meditation and learnt about how important sleep is to their well-being. Picture books were used in school and there was plenty of time to talk. For more information see here. For detail on what children are currently learning, please see class pages. A copy of the Home School Agreement is shared with all parents in September and we ask that you sign on the school update form your agreement. Children sign the class agreement which they negotiate at the start of the year. The partnership between school and home is crucial in a child's educational development. We encourage you to speak with us about any concerns or issues and we do understand that sometimes family life is extremely busy! The impact on a child's learning is evident, from their first days in school, where parents actively engage in their learning. We hope you will listen to your child read every day and that you will ask them questions about their book. We also encourage you to read to your child - books that are beyond their reading ability but have engaging stories will help develop their love of reading and their vocabulary! We can provide question promts if you feel that would be helpful. Homework is set weekly, this should not be onerous, but a chance for you to see what your child has been learning, for them to develop pace and fluency along with a confidence and pride in their work. In Key Stage 2, maths homework will be set mainly on Mymaths, if you do not have access to the internet please let your child's class teacher know. TTRockstars is set weekly for all years 1-6. Spelling Shed is used as a spelling homework. Every child in years 1-6 has a log in.If you wish to discuss the homework set, please contact your child's class teacher. We would like homework to be super-curricular to deepen understanding developed in class and take learning further. The Little Book of Things to do at Home will include suggestions your child may wish to develop which will enhance their learning. These suggestions are voluntary. 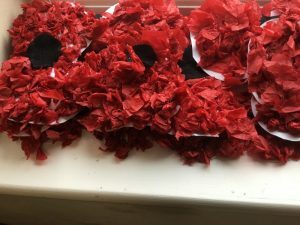 They will be shared and celebrated in school. For more general enquiries about ways to help at home, please arrange to see Mrs Upham. 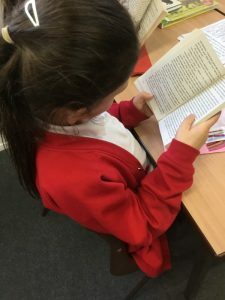 Parent guides are available on our reading and maths pages. Due to the limited space available these clubs have limited spaces available. Places are booked by registering on parent pay. Once the club is full parent pay is closed for that activity. 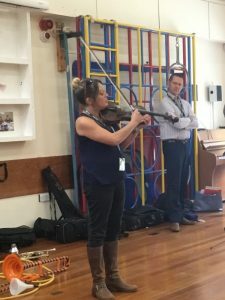 We have instrument lessons in school. Your child can have instrument or singing lessons with Musica at school. In Year 3, they all have the opportunity to learn the recorder - having weekly lessons with Mrs Sneddon and Mrs Divine. 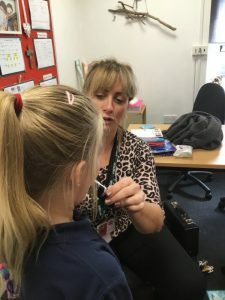 In Year 4, Mrs Fox and Miss Lynch will continue their recorder lessons. 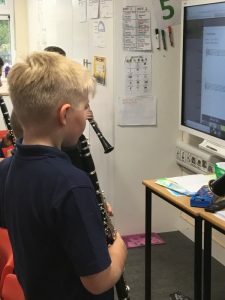 In Year 5 Musica will teach lessons on clarinet. Children can learn a range of instruments and can have individual lessons. Musica also teach children and adults at Music centres across Kirklees if you prefer the lessons to be after school. A number of our children have music lessons outside school. 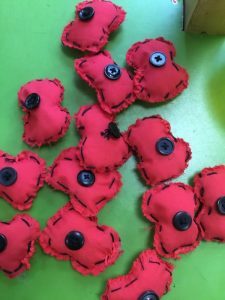 These are also celebrated in school with children having opportunities to play during collective worship and school concerts. We celebrate achievements within school and that happen outside school. Children have the opportunity to perform during Collective Worship to share their musical talents and during school concerts. Some have lessons in school and some have lessons arranged outside school. 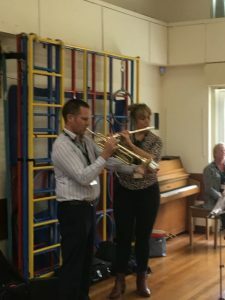 Everyone is welcome to participate - Mrs Upham even played her saxophone! Medals, certificates and trophies from sporting and musical events are celebrated during Celebration Worship. 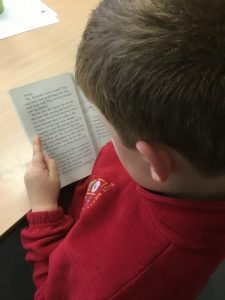 For details about how we teach reading, please see our reading page here. For details about how we teach maths, please see our maths page here. For details of how we build pupil voice into our curriculum please see our pupil voice page here.